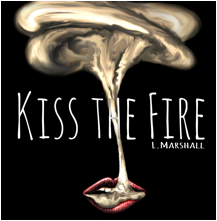 ‘Kiss The Fire’ which is described as neither an EP nor a mixtape, shows L Marshall’s true self as an artist as he gives this project away to his fans as a gift. The singer/rapper/songwriter, who has written for the likes of Cheryl Cole, Loick Essien and co wrote as well as featured on Wretch 32’s ‘Tracktor’, demonstrates his ability to write captivating songs most specifically ‘I.L.Y’ ‘Live All The Way’ and ‘Fire’. You can understand why this is more a project as it allows L Marshall to experiment with different sounds. The track ‘Kiss The Fire’ has a strong dup step sound and ‘Gas Man’ has an edgy rock vibe to it while the rest of the project as a collective is almost split in two, with the first half having more rapleading to more singing and softer beats towards the end of the project. ‘Focus’ brings a soulful and orchestral feel to the project making it one of the standout tracks on the project as L balances rapping and singing on the track exquisitely. ‘Kiss The Fire’ shows off L Marshall’s skills as the versatile artist he is with this exciting project.